I am wholly in support of the lecturers who are striking over this period. The proposals to cut pensions, effectively shifting pension liabilities from institutions to individuals, are outrageous, and I am calling upon the University to respect its staff and negotiate a fair deal. I am further enraged by the University’s claim that the strike will affect all students equally. As a student with dyspraxia, lectures are an integral part of my education. Dyspraxia is a disorder affecting fine or gross motor co-ordination. This does not only affect movement, but means that I have a significantly slower processing speed, and a weaker working memory. This means that I must re-read a passage several times in order to comprehend the information. I study Law, where I am set around 200 pages of textbook reading per supervision; this can add up to over 600 pages per week, making thorough textbook reading near to impossible. Lectures are my main source of information, and I am being denied access to these. As a direct result of the University’s decision to negotiate without any regard to the welfare of their staff, or any notion of fairness, I, along with every other disabled individual, am suffering. Moreover, it is not just disabled students who are being disproportionately affected by the strike. Cambridge, as a university, has very short terms. Lecturers are already having to cram a wealth of information into very few lectures, and there will be no option but to reduce material covered in lectures further in order to accommodate for cancelled lectures. 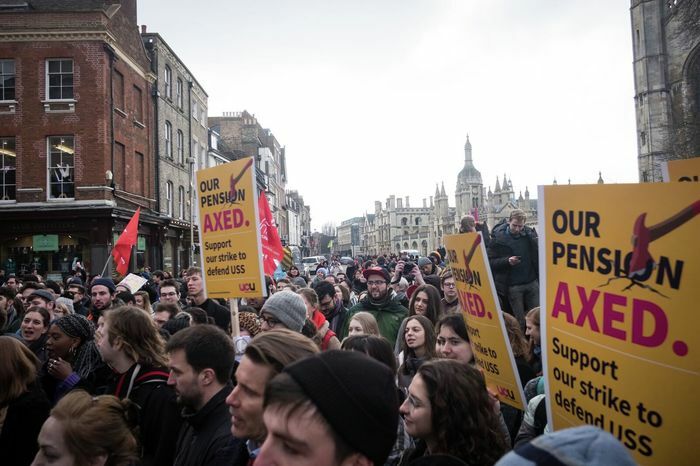 While four weeks of striking might only affect one third of the term for other universities, the full striking period will affect half of Lent term at Cambridge University. Furthermore, there is a disparity between the quality of education received by students studying different subjects within the University. Certain subjects are far more contact-heavy than others. Students who must rely on lectures will be impacted significantly more than those who have fewer lectures and contact hours. Meanwhile, some students are being assured reductions in examination material where lectures are not available, while other students are being told to turn to their own resources, or being offered lectures that merely skim over surface-level issues. This cannot stand. To make matters worse, students are having to pay for the education they are missing. Not only this, but we will have to pay copious amounts of interest, under student loans, for the privilege of paying for a service which will not be delivered. It is all very well to declare that this issue is ‘bigger’ than a final grade. But I do not hear prospective employers reiterating this. I do not hear my doctor reassuring me that the struggle of choosing whether or not to cross a picket line – choosing between my education and my political beliefs – will not trigger my generalised anxiety disorder.